I will try to discuss with you all the meds herbals and plants I know. This amazing plants will help you to increase your health. Pharmacy name: grass basil - Basilici herba (formerly: Herba Basilici), Basil essential oil - Basilici aetheroleum (formerly: Oleum basilici). Botanical description. Annual plants, forming a branching bush about 50 cm in height. Leaves egg-shaped, or slightly tselnokraynie gear, dlinnochereshkovye. In the axil of leaves are false umbrellas white, pink or purple flowers. Homeland Basilica - India, but it quickly spread from there, although north of the Alps to seek it in the wild state of useless. Here it is found only in gardens or on plantations. His sowing in mid-May. Distance between plants in the row should be 20-30 cm so as to light basil sprouts, seeds, only slightly covered with earth. Shoots appear (in warm weather) at 10-14-th day. It is necessary to ensure that basil does not overgrow weeds (loosening and regular watering itself means). Because the plant is unstable to cold, water for irrigation should be at room temperature, settle. If this is an excellent spicy plants grown in the room or on a balcony, a sandy-clay soil with a very small amount of mineral fertilizer (no more than naperstka to flower gorschok). Protected from the wind on the balcony or on the windowsill plants are feeling well. For therapeutic purposes collect flowering plants, and kitchen suitable fresh leaves throughout the season of vegetation. The active substances. Curative effects are especially volatile oil and tannin, and flavonoids. Curative effect and application. Infusion (tea) from the basilica are usually assigned with the bloating and stomach upset. This action recognizes the NHS and Germany. Indications for use are also a lack of appetite, nervous disorders and insomnia. Tea of the basilica: 1-2 teaspoons of herb basil with top fill 1 / 4 liter of boiling water, allow to stand for 10-15 minutes, strain and drink the cup, if necessary. The course of treatment in diseases of stomach and intestines (especially in chronic meteorism): within 8 days of twice daily drink of the cup, then take a break for 14 days and then drink 8 days. Use as a spice. Often herbs that improve digestion, used as spices that give the food a pleasant smell and taste. By the basilica, it refers to the full. Since ancient times, he valued as Soup greens fresh, and as a spice for improving digestion of fatty foods. In the diet kitchen basil helps to reduce salt intake. Especially it is good in combination with rosemary and sage for the meals of boiled or fried fish. Delicacy are all fresh green salad, seasoned with basil, soft cheeses and vegetable soups, shortly before the filing on a table sprinkled finely chopped basil leaves. This spice is to experiment. The use of traditional medicine. 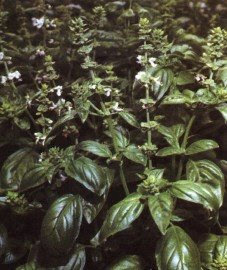 Basil is used mainly as a stomachic, with loss of appetite, constipation and meteorism. Less frequently used in diseases of bladder, often - as a gargle in diseases of throat and compress with suppuration and ill heal wounds. Side effects can be no fear.